Ferguson Perforating supplies batch centrifugal screens for all major types of centrifuges worldwide. Both round hole and slotted screens are available in stainless steel or brass. Our slotted screen has a higher open area than comparable screens that other suppliers offer. Precision aligned locklap joints allow easy insertion during installation. We have developed a mud filter screen with an improved hole pattern. Our screens have a uniform flatness, have straight and parallel long sides, and a flatter working surface with minimal residual stress. All these characteristics together make the screens easier to install, extends the service life and reduces failure due to cracking. Our focus is on providing you screens that lower your operating cost. Ferguson Perforating provides a number of different types backing screens. Tubular slit bridge type backing screens: the flattened bridge style with staggered pattern provides longer life and greater support for the working screen while allowing maximum drainage. It also prevents organic contamination from building up in the backing screen, so that hardly any cleaning is required. We provide complete sets for every centrifuge type to exact dimensions, ready to install. Stabbed liner backing screens: manufactured to exact tolerances and providing excellent support for the working screen. 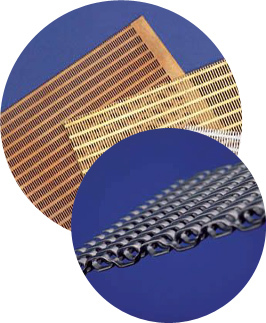 Wire mesh backing screens: woven mesh for centrifugal backing screens are available in brass or stainless steel, no. 4, 5, 7 and 8 mesh. Flanged lipslot screens, ideal for dewatering and desanding of bagasse. Diffuser plate, perforated plate for diffuser decking and wash tables.